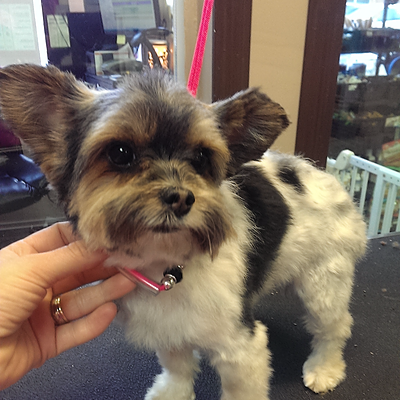 Sometimes the cutest dogs can still look even cuter when you change their haircut, this was the case when i met Benny the Biewer terrier. 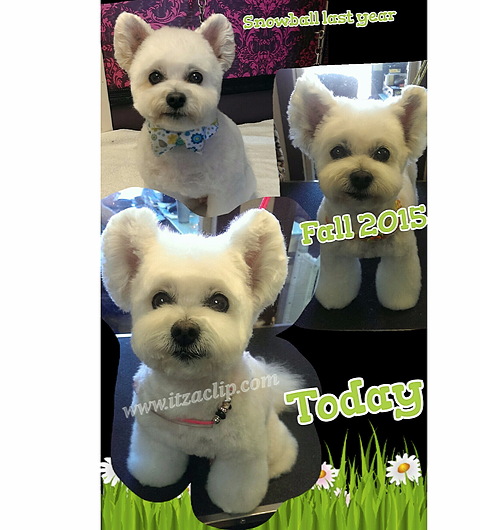 He had been previously getting clipped short all over, so when i first met him in fall 2015 he had no style(pic on left), and it took bath & tidys for 6 months before i could put much of a shape onto him. second pic(on right) is March 2016- What a difference a little hair can make!! You can see how the general shape of his head is changed by leaving more hair on the top of his nose(it looked like it had been shaved before), on the sides of ear to create that full round "Mickey Mouse" ear, in front of ears to soften the bat ear look, and legs to finish the cuteness factor to the max. By shortening chin and leaving more hair up higher, it youth-ens his look. I will apologize for this being only a cell phone video, but i wasn't thinking and did not have any other recording devices on me, nor was i prepared. Also mid way through you hear my hubby cleaning out the bathing beauty and the hose comes off, shooting water up at the ceiling and drenching him, that's why i laughed. Start to finish the whole head. ** since this video, i have stopped clipping the inner tip of ear, for added texture. this can be a personal preference. 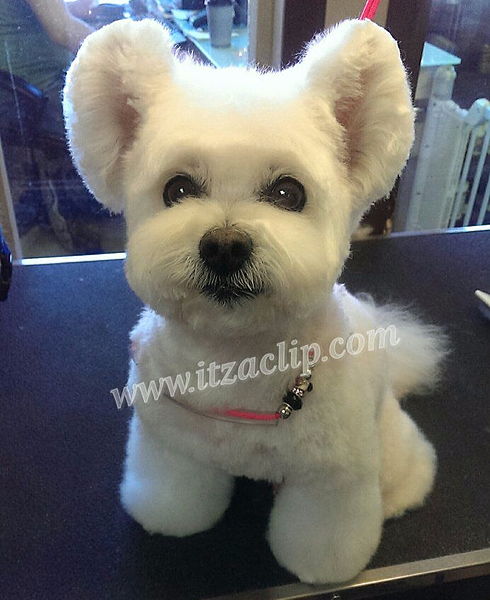 Here is Snowball, a pom/bichon poodle mix. I have been grooming him since puppy, and although he's always been cute, i decided to leave some extra hair on his ears and tweak his style. See the difference! You can play around and tweak the style, there really are no rules, so have fun with it! Here you can see one ear has heavier fringe of hair in front of ear versus the other has been trimmed like in the video above. I often take pictures to help me decide what i like better, or to plan what i will do next. 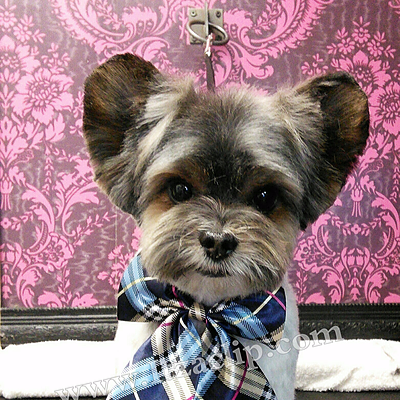 This time i posted the pics online and got 900+ feedback on which style groomers liked. 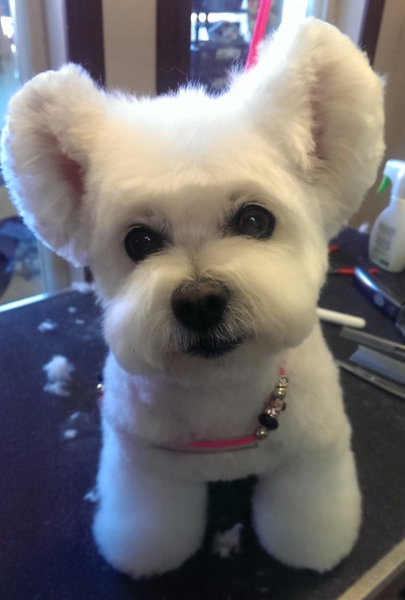 Here is the finished groom, i decided i preferred the shorter ear, unfortunately this 10 year old cutie that i have been grooming every 3 weeks since puppy died the next day due to heart failure during vet sedation. So i will never get a chance to groom him again. Have a hard time getting good pics? here's one way i acheive it. I just recently(june 2016) filmed myself "power grooming" this guy from dryer to finish. stay tuned! Like his Bowtie? See all Finishing Touches we sell. Free shipping on all orders over $100 in Canada.